On January 24, ACVP participated in a public hearing before the New Hampshire Medical Imaging and Radiation Safety Board (NHMIRSB). The Board is considering pending regulatory changes that will have direct and material impact on Cath Lab professionals in the Granite State. The NHMIRSB is in the process of finalizing rules affecting the ability of Cath Lab personnel – specifically affecting RCIS and RCES credentialed staff, and Nurses – to position patients and conduct fluoroscopy in the Cath Lab at the direction of a physician. This meeting was the 2nd of three hearings to finalize these regulations, and will affect the composition and scope of work of Cath Lab staff in New Hampshire going forward. The third, and final, hearing will be held on February 21, and ACVP will also be present for this public Board meeting. Testimony supported all cardiovascular professionals. The Board heard testimony from the Nurse Practitioners Association of New Hampshire (NPA-NH) as well as ACVP. Bethany Boucier, President of NPA-NH, testified that the NPA-NH is against the proposed ruling language which, if included in the final regulations, essentially prevents nurses and cath lab professionals from doing their jobs in the cath lab, restricting any fluoroscopic procedures to RTs. She stressed that this could have catastrophic outcomes under emergent conditions where an RT was not available to assist in the Cath Lab and would essentially severely curtail the safety of the patients in care. Between speakers, the NHMIRSB Chair stated that it was the understanding of the Board that RCES practitioners, by their own scope of practice, do not include fluoroscopy, and that the rule was being written to reflect and codify this so as to improve overall chain of responsibility and workflow in the Cath Lab. Peggy McElgunn, Executive Director of ACVP, testified that, contrary to the Board’s present understanding, all ACVP members are credentialed to perform myriad tasks in the Cath Lab, and this includes Fluoroscopy. RCIS and RCES credentialed staff are eligible to join as practitioner members and thus fall into this category. To exclude these classes of credentialed staff is to ignore their training and qualifications. She emphasized that ACVP was the only professional’s organization with scopes of practice supporting these credentials and any other interpretations were based on unofficial documents or information. 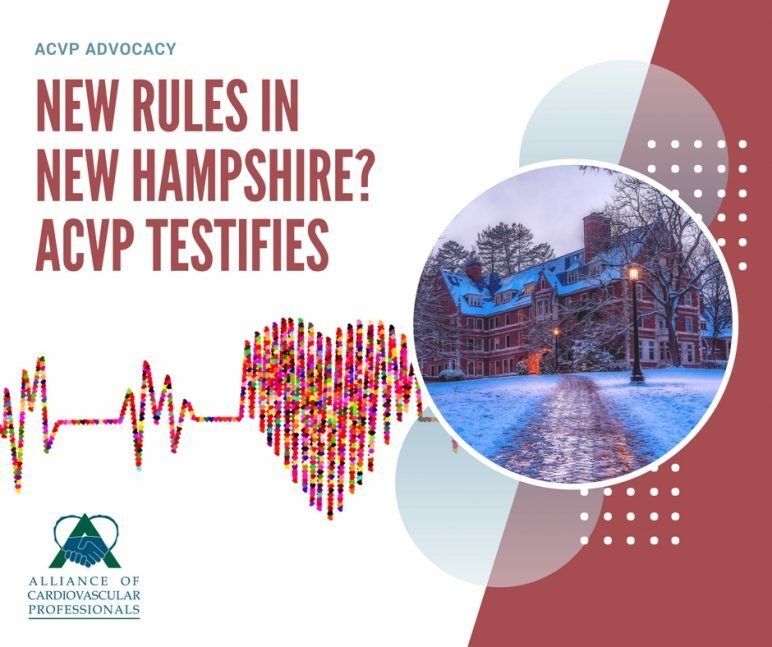 Furthermore, based on staffing levels in New Hampshire, should the final rule be adopted without change to the language at issue, hospitals across the State of New Hampshire would face serious challenges in providing care in the Cath Lab. A survey of all hospitals in the State show that in New Hampshire there are only 24 RT professionals defined as the “eligible class” by the proposed rule that could perform fluoroscopy. The survey also identified that non-radiology professionals staff cath labs in a 12 to 1 ratio. To replace these valuable professionals would be impossible in the short term and probably extraordinarily difficult in the long term. It was noted that RCES and RCIS credentials scope of practice qualifies them to provide fluoroscopic services in every State in the nation. The proposed legislation would strip these professionals of their standing to perform Radiation and Fluoroscopic procedures in the Cath Lab. Copies of the survey were provided to the Board along with the definitions and scope of practice for credentialing of Cath Lab professionals, all of which specifically state that these skills are a requirement for certification, in addition to the other tasks required of a professional so recognized. She went on to state that the performance of work in the cath lab is ultimately at the direction of the physician, and this is a long-standing policy recognized by SCAI, ACC and others. Given that the physician is ultimately responsible for the well-being of the patient in care, Boards across the nation that have had this issue brought before them have universally held that the doctor’s decision as to who should be performing fluoroscopy or other radiation related tasks in the Cath Lab should be unhindered, whether it be a nurse, an RCIS or RCES Cath Lab Tech, an RT or any other trained person. Ms. McElgunn provided the Board with findings of an identical case in California, where the Board ultimately rescinded the restrictive language from their final ruling. Ms. McElgunn reiterated that the doctor’s decision should preclude any attempt to codify in law which professional should have authority or responsibility for performing fluoroscopy in the Cath Lab. ACVP has been intimately involved with the development of legislation across the nation impacting this issue. The Board will adjourn until Feb. 21 at 8:15 am, when they will reconvene to entertain final testimony, conduct a final review and consideration of any changes or amendments to the proposed legislation, and vote on the matter. In accordance with the Open Meetings requirement, any person having business before the Board is welcome to present testimony, by registering their intent in writing with the NHMIRSB Administrator, Tina Kelly, in advance of the meeting at tina.kelly@nh.gov. ACVP is pleased to assist with this process. If you wish to address the NHMIRSB on the matter of the pending regulations, or if you would like to express your concerns or comments about this matter but do not wish to give testimony in this public forum, please contact Peggy McElgunn, Executive Director, ACVP, by email at peggymcelgunn@comcast.net and we will ensure that your request and/or comments get delivered to the Board.